Startups need traction. Startup themselves are defined by their rate of growth. Speed is of the essence. It’s all the more surprising then to often find Founders or founding teams reluctant to sell. By this I mean, sell hard to their customers. That might be selling a product, that might be simply getting someone to sign up; either way ultimately you’re trying to persuade someone to enter your engagement funnel, whether you charge them at the end of it for a product/service or not. Startups get frustrated that they don’t get the growth they want. Yet it’s being bold enough to relentlessly push your product or service which will result in “sales” (and remember that sale could just be a sign up). It’s surprising then when I am often able to sit down to mentor a startup or work with one of my portfolio companies and find that there’s a big list of things which haven’t even been tried – and these are often not onerous or expensive in development terms. 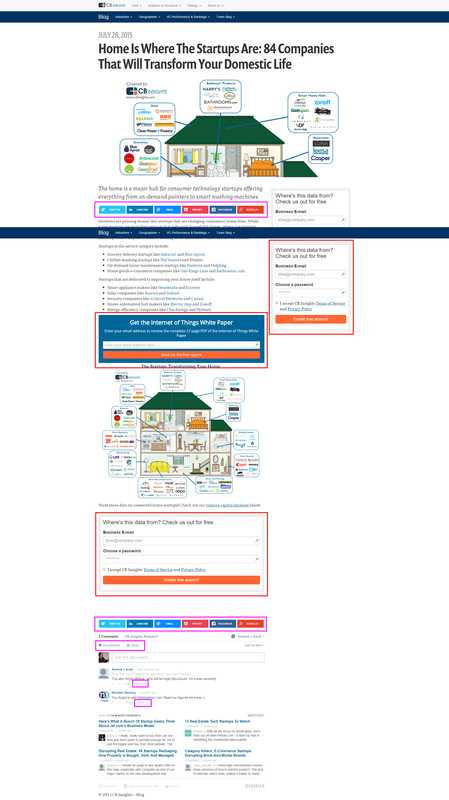 This isn’t the blog post to provide an exhaustive list of what you can do to engage users en general, but I do want to give one example of what I mean by being relentless and hustling to get people in to your funnel, in this case specifically using a blog post as an example (the same by the way, applies to email newsletters). * unlike this blog which has been woefully and sporadically updated! more importantly items in red are calls to action to funnel people into a sales process. Why does this happen? Often because startups are under focused and under resourced. If you have minimal resources you can only do a few things well. Refocus ruthlessly, not doing ANYTHING which doesn’t move the needle on your sales or growth; then you’ll start having the time to pay attention to the detail of your sales or user engagement funnel, test, measure, interpret and iterate – and your sales/signups will go up. Simple as that. So, still wondering why your sales (or user signup) pipeline is not working? Take a leaf out of CBInsights book and get selling, relentlessly. Posted on December 2, 2015 by Andrew J Scott. This entry was posted in Funding & Investment, Marketing and tagged blogging, calls to action, email design, email marketing, emailing, growth, sales funnels, selling, startups, tech blogs, tech start-ups, tech startups, traction, user acquisition, user engagement, user experience, user funnels, user growth. Bookmark the permalink. ← How BIG is your vision? Enter your email to receive notifications of new posts by. What must we do now post-Brexit? What to do with a problem like the Arab Israeli conflict?